The celebration of the IV National Tuna Congress was, without a doubt, a great success. We brought together about 250 people from different areas of our sector, such as public administration, the scientific world, unions, distribution, shipowners and sea professionals, but the main protagonist of the event was the final consumer of our product. In fact, the Congress served to announce the arrival of the first cans of tuna to the Spanish shelves with sustainable product certification, specifically with the distinctive APR (Responsible Fishing Tuna). In short, this congress has built the final consumers of our product into the absolute protagonists of our commitment to sustainability and responsibility. The High Commissioner for the 2030 Agenda, Cristina Gallach, and the General Secretary of Fisheries of the MAPA, Alicia Villauriz, together with the Deputy Minister of Agriculture, Fisheries and Food Policy of the Basque Government, Bittor Oroz, and the President of Opagac, Jon Uría Echevarría, inaugurated the meeting, which was also joined by Luis Figueroa, patron of Albatun Dos, who, thanks to current telecommunications technology, was able to send a cordial greeting from the planet’s equator to the participants in the meeting and also to his wife, who was also there, via videoconference, with all of us, demonstrating the key role technology plays in the development of fishing activity and in the well-being of crew members. Along the day and through round tables, the IV National Tuna Congress addressed, first, the consumption and distribution of canned tuna, with the UNE 195006 standard as an opportunity to involve consumers in the fight against IUU fishing and the defense of sustainable and responsible fisheries. At this table, we counted as moderator with Sandra Sutherland, Agrosfera RTVE director, and representatives of ANGED, ASEDAS, ACES and CECU as participants. The second table served to analyze the state of tropical tuna stocks by species and ocean, and to present the results of the Fisheries Improvement Project (FIP) that Opagac started in 2016 in collaboration with WWF Spain. With the participation of Teresa Molina Schmid, of the General Sub-directorate Fishing Control and Inspection of MAPA; Faustino Velasco, president of Satlink, and Gabriel Gómez, general director of Marine Instruments, the technological advances at the service of the control of the fishery were the focus of the third table; while the fourth addressing the social sustainability practices of this fishery, a key differentiating factor and a benchmark for the way forward, an idea in which agreed the ITF coordinator, Luz Baz, the director of the Spanish office of the International Labor Organization (ILO), Joaquín Nieto, and the expert on the Sustainable Development Goals (SDG) and human rights of the Spanish Network of the UN Global Compact, Javier Molero. 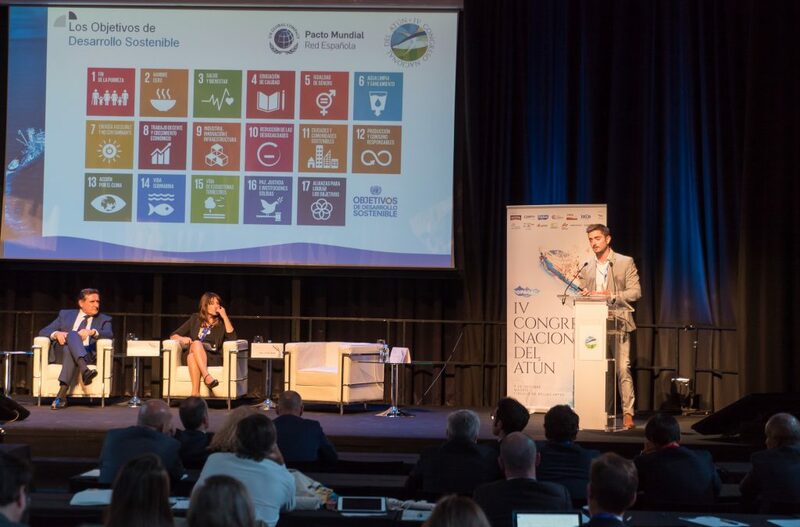 The FIP and the APR standard of the Spanish tuna fleet are added to the efforts to comply with the SDG 8, of growth, inclusion and decent work; SDG 12, responsible production and consumption; and SDG 14 for the sustainable use of oceans and their resources, sustainable fisheries management and support for developing countries. We will continue working on all of them and you already know that all those who want to join us in this trip are welcome on board.